The Alps beckon skiers with the promise of breathtaking beauty, cultural immersion and unparalleled outdoor adventure. In no place is this more apparent than Les 3 Vallees region of France. After landing in Geneva, it’s a 2 1/2 hour drive passing through picturesque villages, climbing into the French Alps toward the largest ski area in the world. 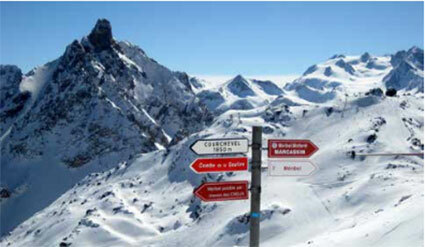 Les 3 Vallees is made up of four interconnected ski areas: Courchevel, Meribel, Val Thorens and Les Menuires. They total 330 runs, 200+ lifts and an astounding 24,000 acres of skiable terrain. To give you an idea of its size, you can fit Vail, Deer Valley, all four Aspen mountains and every single ski area in the state of Vermont inside of it, with room to spare. With one ski pass, each day you can set off in a different direction, skiing from peak to peak and village to village, stopping along the way to enjoy the warm hospitality and gastronomic specialties of the Savoie region. Courchevel, the most celebrated area, is a wonderland of first class service. Divided into four villages, each is designated by their altitude in meters —1850,1650,1550 and 1300 (also known as La Praz). Miles of beautifully groomed slopes, deep powder off-piste skiing and a world class ski school are complemented by high end boutiques, art galleries, and sophisticated restaurants. Luxury accommodations abound, with over twenty 4 and 5 star hotels and ski- in/ski-out chalets featuring every amenity you can imagine. Food and wine lovers will appreciate the more than 70 restaurants, twelve on mountain, and incredibly, seven that are Michelin starred. Jet set parties in the clubs and bars go all night long. Courchevel can be wildly expensive, but it’s an intoxicating combination of luxury, sport, culture, and natural beauty. The geographic center of the area is Meribel, home of the 1992 Women’s Olympic Downhill race. Known as the “heart” of Les 3 Vallees, Meribel offers more affordable accommodations and a very appealing town sprinkled with patisseries, ski shops and reasonably priced restaurants. On the right flank is Val Thorens, known for its wide open glacier skiing and young party atmosphere. One look at the immense trail map and you’ll know why you really need to plan your day. Getting caught in the wrong valley could mean a long bus ride home. The well trained guides are highly recommended to make the most of your experience around the mountains. Les Menuires, in the Belleville Valley, is the largest skiable area, a wonderful family friendly resort with great attention to children’s activities, clubs and lessons, starting as young as 18 months. There’s even a kid’s spa! From Pointe de la Masse to Mont de la Chambre there’s wide open skiing with easy access to all of Les 3 Vallees. In addition, from here you can easily ski down to the charming village of Saint Martin de Belleville for a fabulous Savoyard lunch.